Barred from white schools, North Carolina’s Indians did not attend Chapel Hill until the twentieth century. Eager for education, Indian parents in 1887 requested their own school. 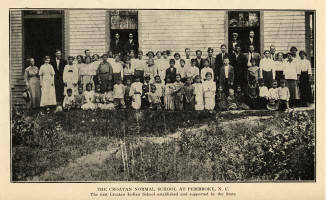 Local people in Pembroke constructed a building, and the Croatan Normal School opened with fifteen students and one teacher. In 1926, its trustees added college courses, and in 1941, the General Assembly changed its name to Pembroke State College for Indians. Until 1953, it was the nation’s only state-supported four-year college for Indians. Following the 1954 Supreme Court's school desegregation decision, the trustees opened the college to all applicants. After the General Assembly established the sixteen-campus University of North Carolina in 1972, the school became known as the University of North Carolina at Pembroke.